This is Cosmo and he was adopted as a puppy in 2007 through the Pontchartrain Humane Society. He will be four years old this month. He loves to chase after birds in the yard. Cosmo shares his home with another Schnauzer, Rocky, who is a month older. Congratulations to Cosmo. He is a handsome Schnauzer. So glad to see one from rescue! 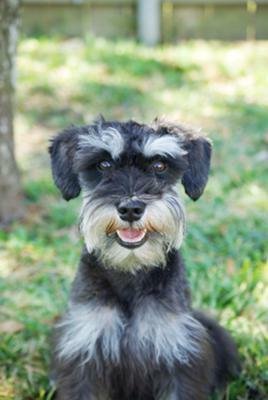 How refreshing to see a great looking schnauzer from a rescue group! Cudos to his owners! Congratulations! Hope you get a few extra treats for winning! 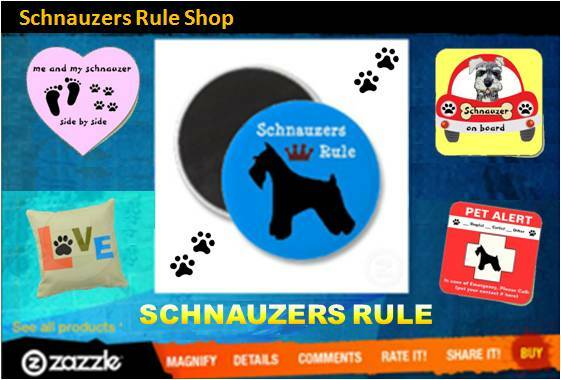 Congratulations to Cosmo for winning Schnauzer of the Month! He sure is a handsome Schnauzer. He is adorable! Love his little "smile", too. Cute name . . . it suits him. He looks like a harmonious and orderly little fellow. Everyone that takes one look ay Mini salt and pepper (Binky) say aww he is the cutest one I have ever seen...But this guy is to die for.What perfect marking.